This concludes my 'Wisdom Trilogy', an exploration of listening and discerning God's call on our lives as we move through Holy Week and into Easter. This was preached at the Great Vigil of Easter, 2015. The New Fire has been lit, yet we are still surrounded by the darkness of night. The light has pierced the darkness, but it has not yet driven it from our presence. And though the silence of Good Friday and Holy Saturday may still be lingering, we are invited to open our ears…to hear the stone rolling away, the shifting of a once still body, the sound of burial clothes falling onto hard stone, breath returning. Incline your ear, and come to me; listen, so that you may live. We have heard the testimony of God’s mighty works throughout creation, but the world we know around us still cries out for deliverance. Wisdom has beckoned us with her voice, a voice that enlightens even the most callous and cruel, and yet, even we sometimes fail to heed her invitation. God has promised us a new heart, a new spirit…but just as the women fled the empty tomb in both terror and amazement, we still struggle to grasp the depth of this mystery. But in spite of these paradoxes, we are here, gathered around a New Fire, gathered around the altar, gathered around a font as we prepare to receive someone into the household of God. Ho, everyone who thirsts, come to the waters; and you that have no money, come, buy and eat! Come, buy wine and milk without money and without price. Why do you spend your money for that which is not bread, and your labor for that which does not satisfy? Listen carefully to me, and eat what is good, and delight yourselves in rich food. Incline your ear, and come to me; listen, so that you may live. It’s a fool’s errand, to declare in the face of persistent and unrelenting suffering that, against all odds, life itself emerged from a stone tomb and a dead carpenter once again felt the beating of his heart. Yet that is precisely what I can’t help but proclaim. So, tonight I’ll be a fool, if what it means is that, knowing the pain we all may feel, knowing the pain and suffering that afflicts our community, knowing the human tragedies we witness every single day, I still declare that there is reason enough to hope…that the same kind of new life is possible in our world today. This is not a promise that claiming and clinging to the promise of new life, of resurrection, will suddenly set the world aright…will remove all sense of pain, anguish or suffering. For even the resurrected body of Jesus bore the wounds of his crucifixion. 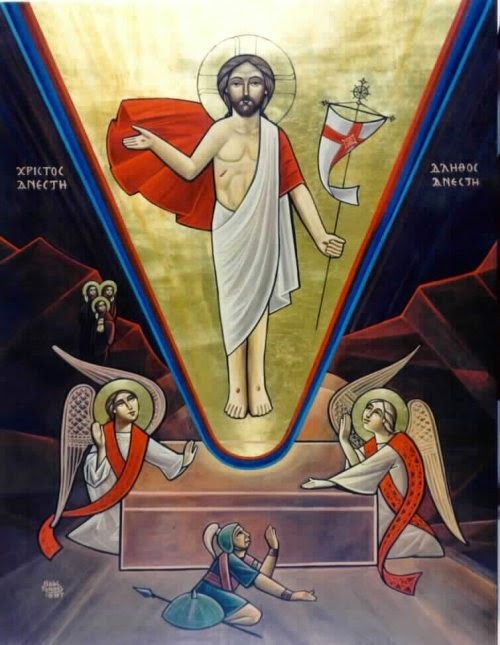 What we proclaim at Easter, however, is the truth that we will no longer be reduced to our suffering…the truth that we will not be lost as we navigate the chaotic oceans of everyday living…the truth that, though we may still feel its venomous effects, death does not have the final word. My word shall not return to me empty, but it shall accomplish that which I purpose. This ‘word’ of resurrection isn’t found just in the breathing-again body of Jesus. It is found in the boldness with which a person diagnosed with depression steps outside the confines of their home and determines to find even one thing to enjoy in this world. It’s found within the struggle of an addict, who makes it through 24 hours of sober living and says, “I can make 24 more.” It’s found in the forgiving embrace of an Egyptian bishop who, when faced with the soul-crushing news of an ISIS-led massacre of 21 Coptic Christians, is able to say, “We do forgive the killers from the depths of our hearts.” And the ‘word’ of resurrection is found here, in this place, in all of us, with the myriad of ways we have felt the sting of death, yet gather here in the evening to remind the darkness that it doesn’t define us. *The texts were Isaiah 55:1-11, Proverbs 8:1-8, 19-21; 9:4b-6, Ezekiel 36:24-28, Romans 6:3-11, and Mark 16:1-8.